I am a trained actor; graduating from the prestigious 3-year acting course at the Royal Academy of Dramatic Arts (RADA) in 2001 I have worked and taught in the profession ever since. I have appeared in leading roles on stage in West End productions and with the Royal Shakespeare Company in both London and Stratford Upon Avon. I have worked in film and television, commercials and numerous theatre productions in fringe, festivals, abroad and on UK number one tours. As a professional actor I owe a great deal to my training at RADA – it is one of the most highly regarded schools in the world for acting. I endeavour to pass on some of this knowledge and explore with students the benefits of studying at places like it. 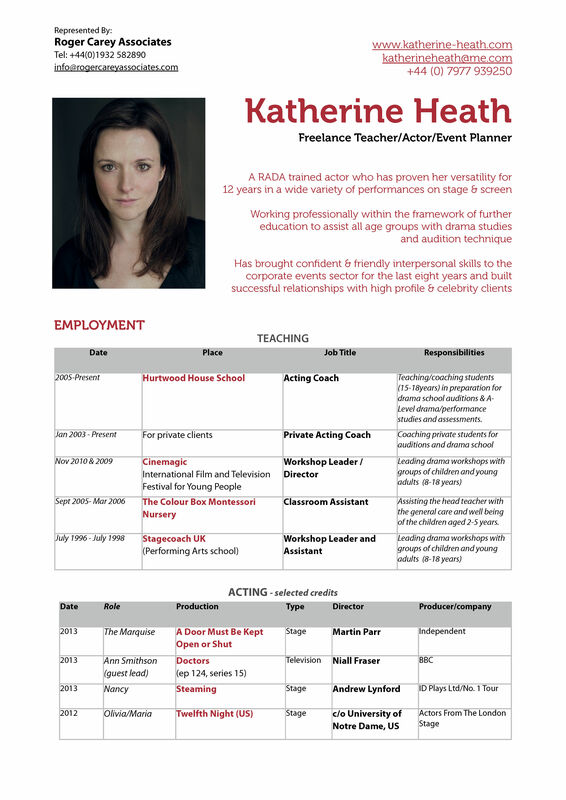 Alongside performing I have dedicated the last 8 years to a part-time teaching position at Hurtwood House School, Dorking, Surrey, where I spend two days a week providing one-to-one acting tuition to 16-18 year olds. It is a private school famous for its performing arts faculty and I have loved this opportunity to work with students and be part of their journey as they go on to succeed in study and perform on stage and screen. I know that the one-to-one tuition I received as a student myself at Hurtwood House was the key to winning a place at RADA. Whilst a teacher I have helped students successfully apply to RADA, LAMDA, GSA, National Youth Theatre, Drama Centre London, ALRA, The Juilliard School (New York, US), American Academy of Dramatic Arts (New York, US), Arts Ed, Guildhall School of Music & Drama, and Bristol Old Vic Theatre School. I care a great deal about 16-18 year olds and say confidently that during my time teaching I have built up an affinity with the age group, recognising what approach is suitable & how they best respond as emerging young adults. I would like to dedicate more time to helping students like them and whilst I continue my commitment to Hurtwood pupils, I now open up the service to a much wider audience. Through Hurtwood my knowledge of the drama school process has grown with the years of experience along with a continuing education of playwrights and texts from Shakespeare to Jack Thorne. As an actor I have a wealth of contacts in casting for young actors and first-hand experience of how to navigate through a sometimes daunting industry. I also sing and have many associates who I can recommend for further musical training. I have developed my own specialist interest in voice as I can see how much confidence it can bring to young adults in not only performance but all inter-personal relationships at school and home. 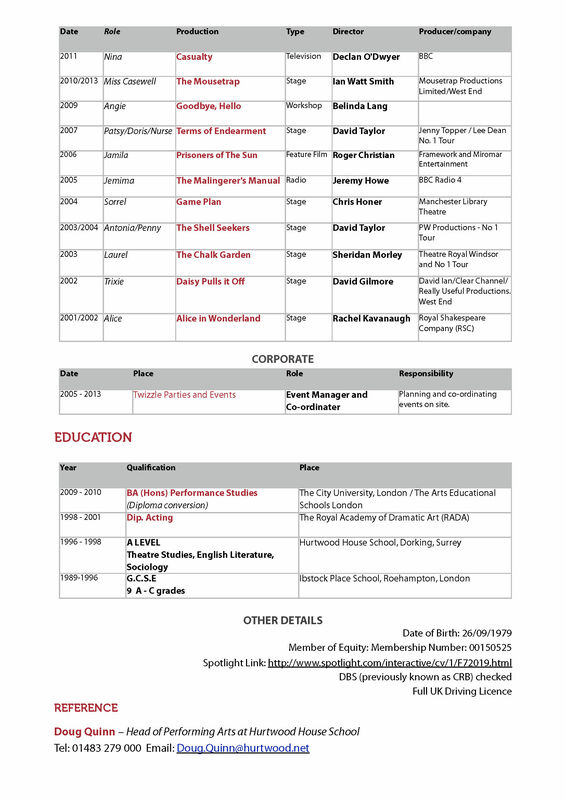 I have worked on tour in the USA teaching Shakespeare throughout state universities as part of the organisation Actors From The London Stage, and participated in programmes such as Cinemagic for children in Northern Ireland and Stagecoach in the UK.